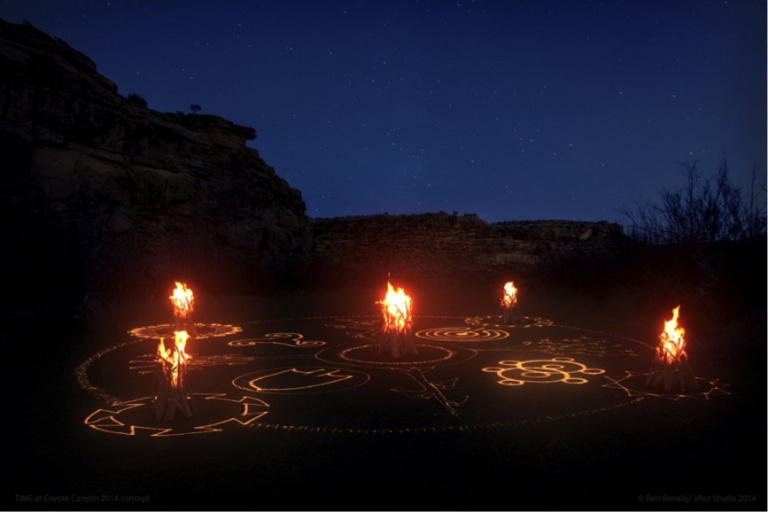 (Art & Emerging Technology, 5 May 2014) – New Mexico is about to take a bold step into the future of immersive arts. New Mexico Arts purchased a 50′ portable dome with a 3k seamless projection, an artist friendly server system and are creating art that takes dome presentations to the next level in virtual environments. And it doesn’t stop there. The art will be presented as a collaboration of Chinese artist Ai Weiwei; Navajo artist Bert Benally; special effects artists xRez and media artists: Ethan Bach, Will Wilson, Robert Schwan, and Robert Henke along with a documentary film by Daniel Hyde and Blackhorse Lowe. This project entitled Pull of the Moon envisions the future of art to come – collaboration, cultural fusion, natural environment and technology displayed in an immersive dome. Pull of the Moon is inspired by the story of two Navajo brothers who hid in the Coyote Canyon while their relatives were forced on the Long Walk in 1864. Navajos were forced at gun point to walk up to thirteen miles for three hundred miles. Hundreds died. In 1868, the U.S. government released the Navajo and many returned to the area. Pull of the Moon will feature earth-based drawings using sand and bonfires making reference to both Mao Tse-tung’s Long March and the Long Walk of the Navajo. In collaboration, artists Ai Weiwei and Bert Benally will create a sand sculpture designed by Ai Weiwei in collaboration with Bert Benally. Weiwei and Benally will create the Pull of the Moon installation on the evening of June 13th during a full moon. The significance of the full moon and the family stories from the residents of the canyon add to the entire experience designed to transcend commonalities between Weiwei and Benally as conceptual artists collaborating on tribally-controlled land. The entire event is a happening of sorts, built on the Navajo Nation for the Navajo people and will not be open to the public, which inspired the virtual immersive fulldome art for public viewing. Weeks previous to the event, special effects artists, xRez, will use specialized photography techniques to capture Coyote Canyon to later be recreated in a 3D digital environment similar to their work Outlands. xRez will come equipped with a 3D Robotics X8 RC Quadcopter, 4 Canon 5D DSLR cameras, lenses ranging from an 8-15mm f2.8L zoom to a 300mm f4L prime, 3 Nodal Ninja M1 panoramic heads, and a Gigapixel panoramic head, and a Sony a7R (just to name some of their equipment). They use Sparse/Dense Photogrammetry among other techniques to capture, recreate and texture the canyon into an identical virtual 360° representation. During the Coyote Canyon event, media artists Ethan Bach, Will Wilson, Mihio Manus, Don James and Robert Schwan will use some similar techniques along with live action footage to capture the happening. This documentation will then be delivered to xRez to be added to what will become a virtual fly through of the canyon and the art installation itself. The synthesizing of the latest technology with cultural history, current expressions of cultural repression along with the future in immersive art in the fulldome is an idea whose time has come and will help set the stage for more art, culture, science and technology fusions of artwork. The opening of the artwork will be displayed at two different locations on two different dates. On July 16, 2014 from 5pm to 7pm there will be an opening reception at the Museum of Contemporary Native Arts, the virtual fly through can be viewed on a flat panel screen. An outdoor sound installation program with TIME artist Bert Benally and German Sonic Artist Robert Henke www.roberthenke.comto perform in the courtyard created from sounds at Coyote Canyon by Bert Benally. This project is made possible by New Mexico Arts as part of TIME (Temporary Installations Made for the Environment), Vortex Immersion Media, MoCNA (Museum of Contemporary Native Arts), Bach Multimedia, and the Navajo Nation Museum. Project Coordinator and Curator: Eileen Braziel.